To investigate the effects of strength training on abundances of irisin-related biomarkers in skeletal muscle and blood of untrained young women, and their associations with body mass composition, muscle phenotype and levels of thyroid hormones. Eighteen untrained women performed 12 weeks of progressive whole-body heavy strength training, with measurement of strength, body composition, expression of irisin-related genes (FNDC5 and PGC1α) in two different skeletal muscles, and levels of serum-irisin and -thyroid hormones, before and after the training intervention. The strength training intervention did not result in changes in serum-irisin or muscle FNDC5 expression, despite considerable effects on strength, lean body mass (LBM) and skeletal muscle phenotype. Our data indicate that training affects irisin biology in a LBM-dependent manner. 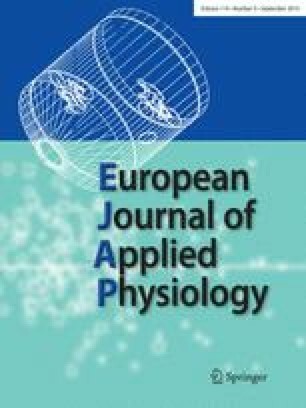 However, no association was found between steady-state serum-irisin or training-associated changes in serum-irisin and alterations in body composition. FNDC5 expression was higher in m.Biceps brachii than in m.Vastus lateralis, with individual expression levels being closely correlated, suggesting a systemic mode of transcriptional regulation. In pre-biopsies, FNDC5 expression was correlated with proportions of aerobic muscle fibers, a relationship that disappeared in post-biopsies. No association was found between serum-thyroid hormones and FNDC5 expression or serum-irisin. No evidence was found for an effect of strength training on irisin biology in untrained women, though indications were found for a complex interrelationship between irisin, body mass composition and muscle phenotype. FNDC5 expression was closely associated with muscle fiber composition in untrained muscle. S. Ellefsen, O. Vikmoen, G. Slettaløkken, JE. Whist, H. Nygaard, I. Hollan, I. Rauk, G. Vegge, TA. Strand and BR. Rønnestad member of The Lillehammer Research Center for Medicine and Exercise Physiology. The online version of this article (doi: 10.1007/s00421-014-2922-x) contains supplementary material, which is available to authorized users. This study was supported by grants 203961 and 222717 to SE from the Regional Science Fund—Innlandet, Norway. The funders had no role in study design, data collection and analysis, decision to publish, or preparation of the manuscript. Thanks to Daniel Hammarström for valuable assistance with statistical analyses. Thanks to students Øyvind Skattebo, Knut Sindre Mølmen, Thomas Fenne, Fredrik Lie Haugen, Amund Løvstad, Trine C. Larsen, Gunnar Disch, Eirik F. Langøy and Elisabeth Hildenes for assistance during intervention follow-up and data sampling.